I'm having a bathroom remodel done that involves replacing the leaky old galvanized steel plumbing with PEX piping. I have zero plumbing experience, but I'm not convinced it's being done properly. The photo below shows what the contractor installed for a separate shower and bathtub, along with a vent pipe. The shower and the tub each have a 90 degree bend that leads to a downstream running (U) trap and on to the main sewer pipe. Do I need to make the contractor redo this? It's my understanding that both the shower and the tub should have a P-trap directly beneath the drain. There's 3 feet between the shower drain and the running trap that I worry will start to smell over time. On top of that, the pipe downstream of the trap actually rises by about half an inch before it joins the sewer main. There's about 6 feet of pipe in the photo that will never fully drain. I'm no plumber, but that absolutely needs to be redone, correct? Finally, is the vent acceptable? I think it's OK to have a shared vent for both, downstream of the shower and upstream of the tub, but want to make sure. The vent rises at about 20-30 degrees for about a foot before reaching the vertical vent pipe which runs up through the bathroom wall. Is this considered a "horizontal" vent, or is that kind of slope OK? Browse other questions tagged plumbing shower bathtub drain-waste-vent contractors or ask your own question. Where should the main stack vent go? Have bath tubs ever been considered “self-venting” in plumbing code? How many vents are required for drains under a slab and what locations? 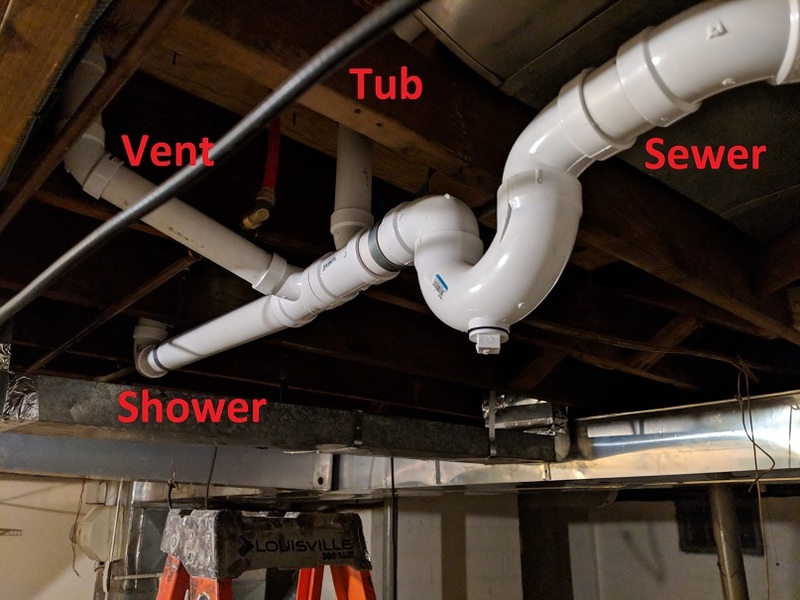 Should my bathroom's plumbing vent be downstream of the toilet connection? Can I add a wye fitting to this cast-iron drain stack?